Shielded Octotroopers are Octarian fighters. They use shields to protect themselves from attacks. Shielded Octotroopers appear identical to Octotroopers, but are equipped with an impenetrable shield that is similar in appearance to a welding mask. They possess an exposed backside which can be inked to defeat them. Shielded Octotroopers will also rotate to watch Agent 3, making them only vulnerable if the player sneaks up behind them, or distracts them with a Sub Weapon. In Octo Canyon, their shields can be destroyed instead of having to distract them with any type of Sub weapons. Shielded Octotroopers appear in the first mission, but are uncommon afterwards. Four Shielded Octotroopers appear in Octotrooper Hideout. Two, at the end of Spreader Splatfest. Four, on narrow walkways of Pinwheel Power Plant. Two of these are Shielded Octodivers. 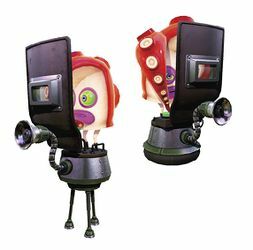 To defeat Shielded Octarians, they must be distracted, making them turn around and show their vulnerable side. Distracting them with Splat Bombs, Burst Bombs, or Seekers, is an easy method as they will turn around in surprise. It is also possible to simply sneak around through ink while in squid form, as they are unable to notice. A Shielded Octodiver in Splatoon. A Shielded Octotrooper in Splatoon 2. A Shielded Twintacle Octotrooper in Splatoon 2. The new varient of Shielded Octotrooper. A Deluxe Shielded Twintacle Octotrooper in Splatoon 2. The other variant of Shielded Octotrooper. A Sanitized Shielded Twintacle Octotrooper. A Sanitized Deluxe Shielded Twintacle Octotrooper. Concept art of Octotroopers, with the Shielded Octotrooper's shield at the lower left. Concept art of the shield, from The Art of Splatoon.